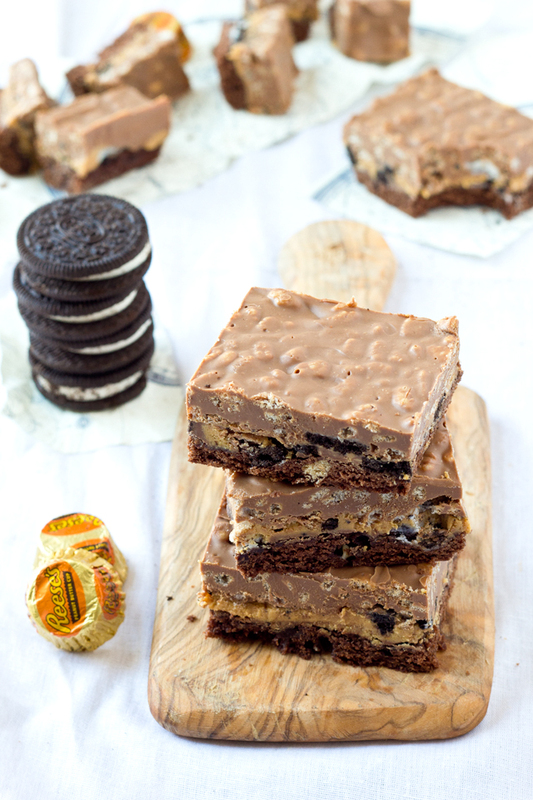 mbakes: Peanut Butter Crack Brownies & Shortlisted for the Cosmopolitan Awards! Peanut Butter Crack Brownies & Shortlisted for the Cosmopolitan Awards! I was finishing up my last bits at work on Monday when it got to 6pm and I remembered something. I opened a new window, tapped into Twitter and nervously scrolled through to find that tweet. The one with that link that would take me to the Cosmopolitan Blogger Awards 2013 Shortlist. As I pressed the link, my stomach sank. It sank further when I saw a blank page. I made a quick scurry to the loo’s moments later to see if the link worked best near toilet facilities (obviously this had to be an option in my desperate state). A few taps later and I was prancing around the workshop, jeans at my thighs, jumping like a loon with Nat (she had no idea what was going on). I had been shortlisted again!!!! Er. Mah. GAAAAHD. Who better to thank than the person reading this right now? Seriously, thank you so much! To celebrate I have made something close to crack. I couldn’t think of a better way to emanate my excitement and show thanks to you all. Really I couldn’t. Luckily this stuff wont kill if you get hooked, you might gain a few but hey – see them as happy pounds. 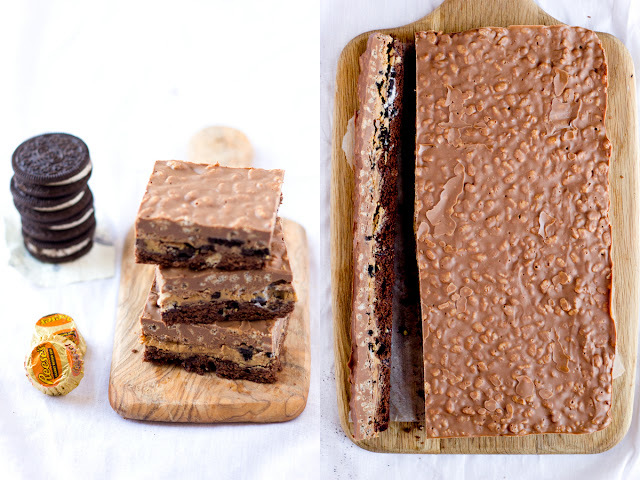 This brownie/rice crispie cake on steroids is jam-packed with every single confection known to man – it’s salty too so it's right on trend. The recipe uses a brownie packet mix, but only because there is so much going on that I defy you to taste the difference. 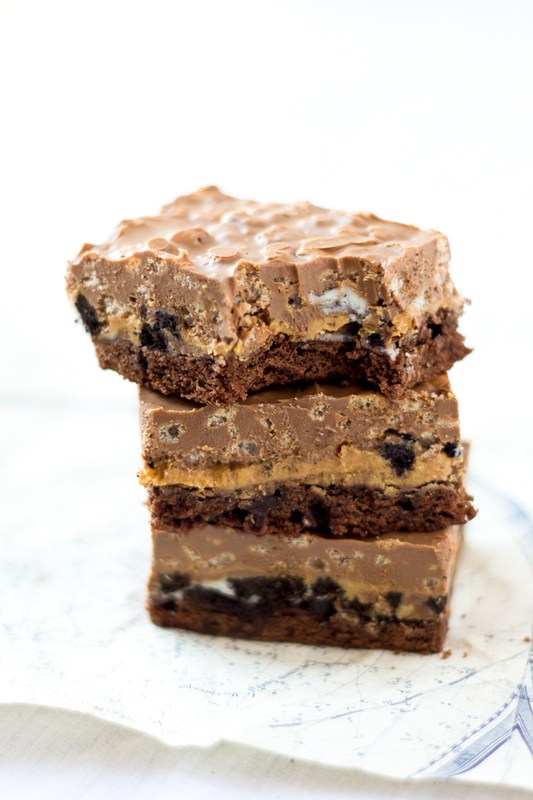 Note: Grab the most indulgent looking Brownie mix i.e. the one that says ‘Indulgent Brownie Mix’ so people don’t think your skimping on quality even though it only cost you £1.78 – the price of a good chocolate bar. 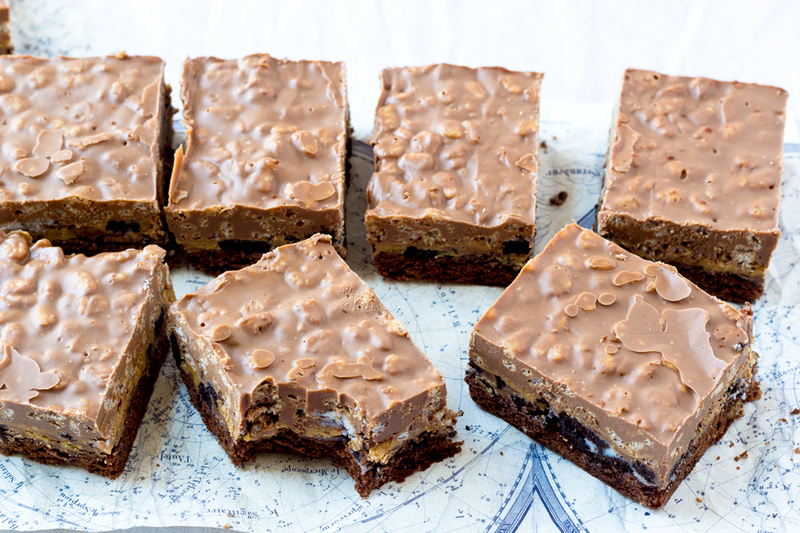 If you’re still not sold, have a look here and here for sole brownie gooooo-oooo-ooodness. 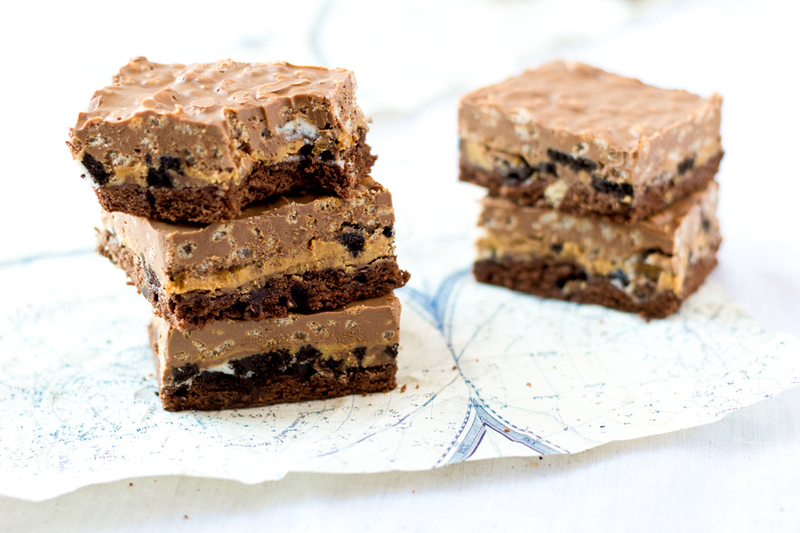 Start by making brownies in a lined rectangular pan according to directions and roughly chopping Oreos and peanut butter cups. 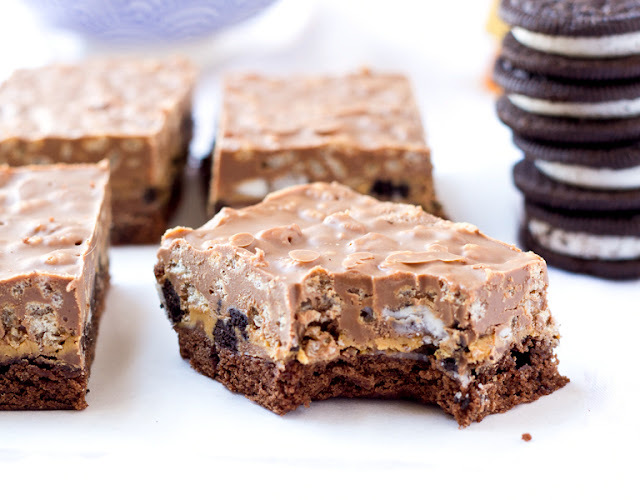 Take the brownies out of the oven 5 minutes before the required baking time and sprinkle chopped peanut butter cups & Oreos over the top. Return to the oven to complete baking. Once brownies are baked, remove from oven and immediately spread the melted peanut butter cups & Oreos around the entire surface of the brownie using a spatula. 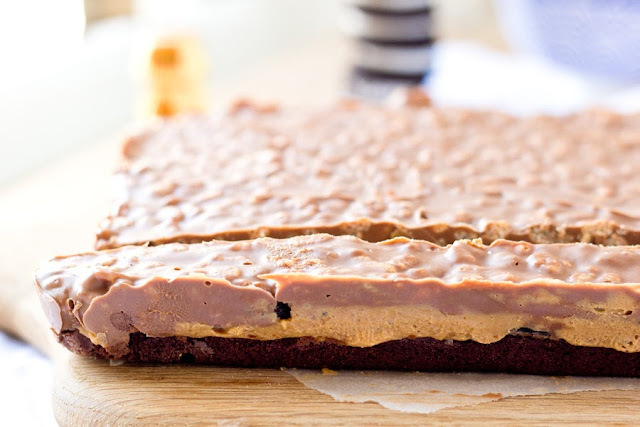 Evenly spread half a cup of peanut butter on top of the chocolate layer and set aside. In a large microwaveable bowl add the remaining peanut butter, milk chocolate chips and butter and microwave in 30 second bursts until just melted, making sure to stir each time. Pour in rice crispies and stir until combined. Evenly spread over the brownie. Cover and refrigerate for at least 2 hours to set. The brownies will last for up to 5 days. We managed to raise £370 for Race For Life! And I crossed the finished line! Wooohooo. Thank you to all those who sponsored us, Blackheath, you nearly killed me but it was for the worthiest of causes so I'll let you off.